Five hours after a Washington judge ruled that she would enforce a Los Angeles judge's order that Casey Kasem's medical care be supervised by his daughter--and not his wife--Jean Kasem held an impromptu press conference in Washington in which she played audio of her 82-year-old husband moaning. 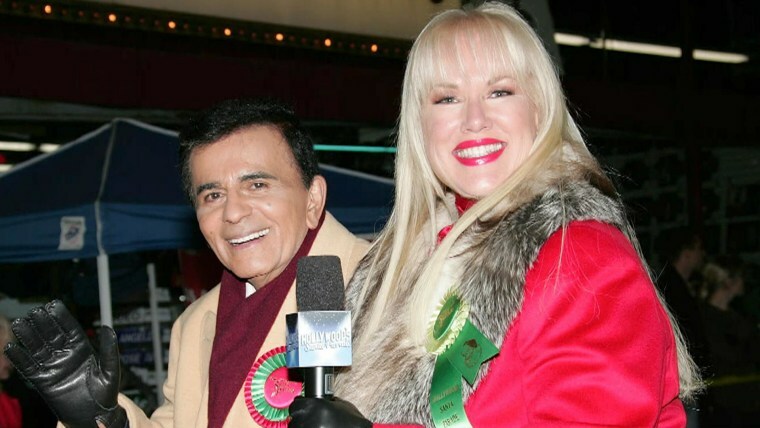 The legendary "American Top 40" host is suffering from Lewy Body dementia, and Jean Kasem claimed the audio she played from her cell phone reveals he is upset about the judge's ruling. Casey Kasem cannot speak or move on his own and is fed through a tube in his stomach. "He's crying, he's a man of very few tears," Jean Kasem said. Claiming that the courts are trying to "rip him away from his family," Jean Kasem called her husband an "American treasure" and added, "He wanted to go out strong…he wanted to leave beautiful memories. That was all gone today." The hearing in Kitsap County was held after Jean Kasem refused to comply with Los Angeles Superior Court Judge Daniel S. Murphy's order granting Kerri Kasem, the radio icon's eldest daughter from his first marriage, a temporary conservatorship over her father's medical care. Kerri Kasem was denied entry on May 23 to the Silverdale, Washington, home where Jean and Casey Kasem have been staying for three weeks. "They should be ashamed that they have done this to their father," Jean Kasem said at the news conference. On Friday, minutes before visiting her father for the first time, Kerri Kasem and her siblings issued a statement saying they "are again devastated by Jean’s poor judgment." "In court today, Jean Kasem claimed to be concerned about the privacy of her family," the statement said. "Hours later, Jean publicly disseminated an audio tape that purports to be Casey Kasem in anguish. This invasion of family privacy is disgusting and reprehensible. Jean is intentionally causing her husband pain by adding further stress which is the worst thing you can do for anybody suffering from dementia." Kitsap County Judge Jennifer Forbes ruled that Kerri Kasem must be allowed to visit her father for an hour each day, but that the visits must be kept private, and if photos are taken, they cannot be shared with anyone. Kerri Kasem agreed, saying, “My dad would never want to be seen like this." Jean Kasem, 59, removed her husband from a Santa Monica facility on May 6 at 2:30 a.m. and took him to Washington without telling his family where they were going. A week ago, Jean Kasem held another hastily arranged news conference saying she and her husband went to Washington with their daughter, Liberty, to vacation and see medical specialists. Kerri Kasem said in court that she is worried about her father because he has developed bed sores and infections in his lungs and bladder since he was removed from the Santa Monica facility.